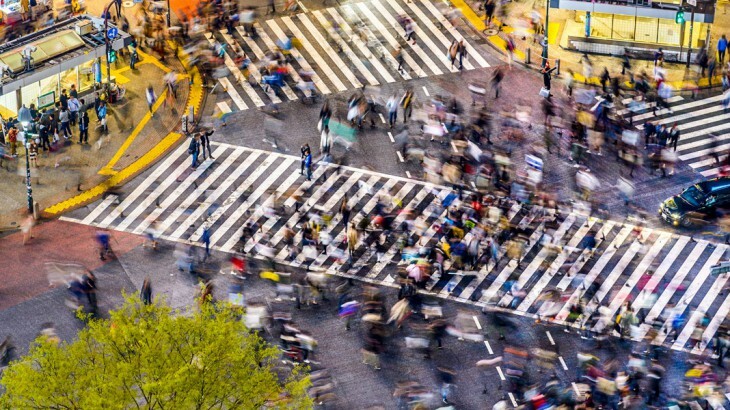 Rowan Goldthorp, our Product and Commercial Manager, recently returned from an escorted tour of Japan, where she discovered a country well known for its beautiful scenery, unique history, incredible food, technological advancements and quirky culture. Read her trip report below to inspire you on your own Japan tour. ‘Yaeba’, crooked teeth, is considered attractive; so much so that girls go to the dentist to get their teeth un-straightened – ouch! Travelling to Japan, I didn’t know what to expect. I had been told about so many different things: from cat cafes and cupboard bars, to shoe and food etiquette; and never to shake hands but to bow instead – there were so many things to remember. Of course, I forgot almost all of it when I landed and confused many Japanese people by reaching out my hand to shake, only to receive a deep bow instead. So, I began my journey as a blundering westerner through this amazing country. Our tour started in Tokyo. This city is beyond impressive. 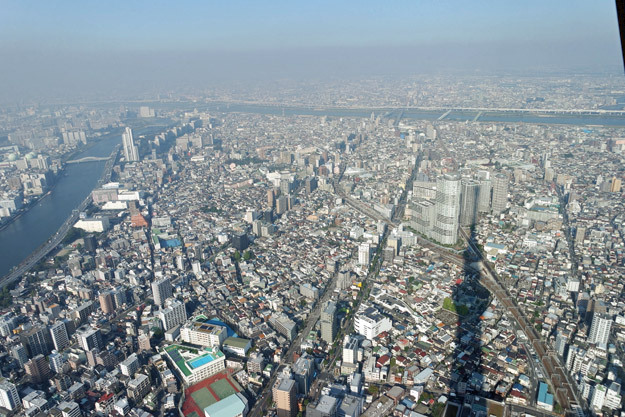 From the top of Tokyo Skytree, it was almost impossible to see the end of the city sprawl. We made our way through a maze of skyscrapers and raised railways to the oasis of the Imperial Palace Gardens. Carefully manicured lawns and trees stretched out over a park half the size of Central Park in New York; a welcome respite from the Japanese Metropolis. 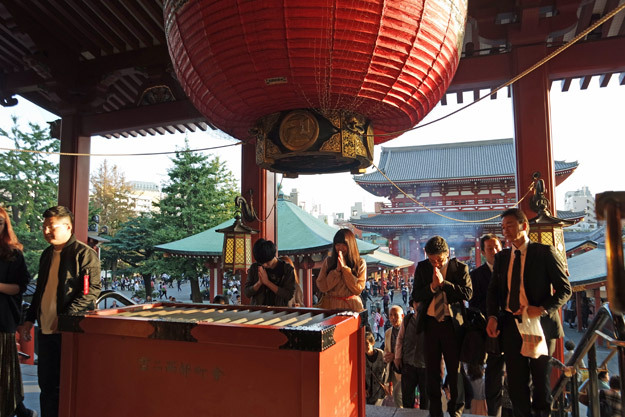 We continued to Senso-ji, an ancient Buddhist Temple founded in the 7th Century. It is painted a brilliant red and beautifully decorated; and surrounded by tiny market stalls selling lots of colourful and quirky souvenirs. We also visited the interesting Edo Tokyo Museum before taking a dinner cruise on Tokyo bay: the food was delicious and we even saw fireworks over Disneyland. The next day we took a leisurely walk around Hamarikyu Gardens, with immaculately presented lawns and trees set against gleaming skyscrapers. We continued to the Shinto Meiji Shrine and learned how to purify ourselves with water at the Chozuya (water ablution pavilion) before entering the Shrine. This process is of course optional and something I would recommend for an authentic experiences on your Japan holiday. Our journey continued to the Fuji Five Lakes area. 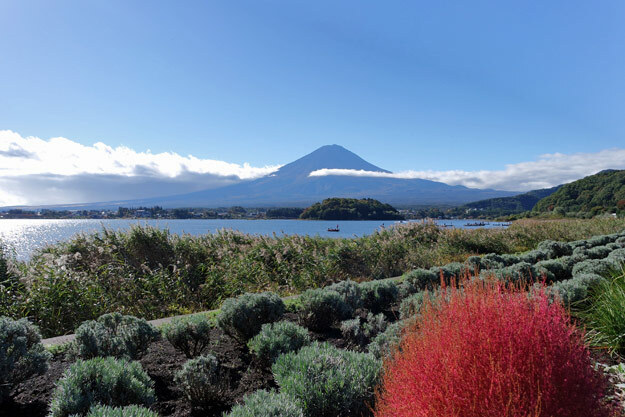 A bit like a volcanic Lake District, the area is absolutely stunning and a favourite weekend break destination of exhausted Tokyo city workers. On the way, we stopped at a traditional house to make soba (buckwheat) noodles. 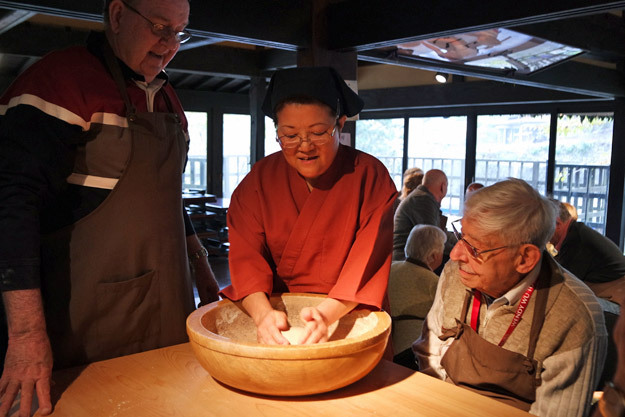 Buckwheat flour was added to water and kneaded for a long time, before being rolled out thinly, folded into a small slab and then cut finely into flat noodles. The noodles were then steamed and enjoyed for lunch along with freshly cooked tempura and miso soup. One of the tour’s highlights was a visit to Mount Fuji, or Fuji-san. We were extremely lucky to have a clear day – as some will know, it is very rare to see the summit of the mountain! We drove up to the Fifth Station to get a view of the summit, and a beautiful view looking back out across the lakes. On the way back, we visited the rural Iyashi no Sato historical village, which is famous for its traditional thatched roof houses. Some of the houses are now museums demonstrating the traditional way of life, and some are wonderful little shops selling local crafts such as pottery, incense, or weaving. Luckily the weather stayed mostly clear and we could see Fuji-san again from a different angle! We took the Hikari (second fastest) bullet train from the Fuji area to Kyoto. The bullet train is an absolute must; nothing compares to seeing the countryside whip past the windows! Our awesome guide Yumi ensured we all boarded and disembarked efficiently as the train only stops for one minute at each location! On arrival we stopped at an ochaya (teahouse) style restaurant where we enjoyed a beautifully presented Japanese set lunch. 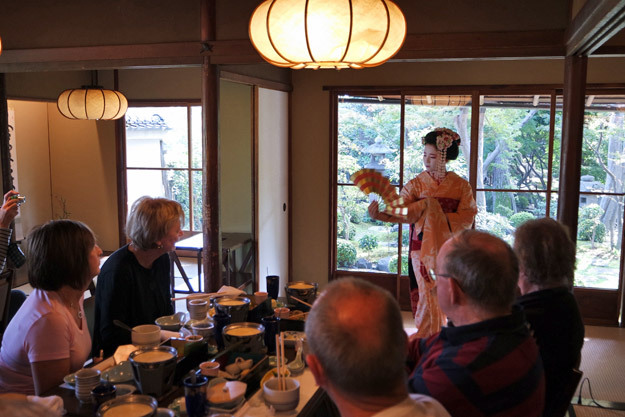 After lunch, we were graced with a performance by a local Maiko (apprentice Geisha). She was adorably beautiful, impeccably mannered and gorgeously dressed. It was an honour to meet her. Sightseeing in Kyoto itself included the Golden Pavilion (Kinkaku-ji), Ryoan-ji Temple, Kiyomizu-dera Temple and a hilarious origami class. Temples in Kyoto are unsurpassed. 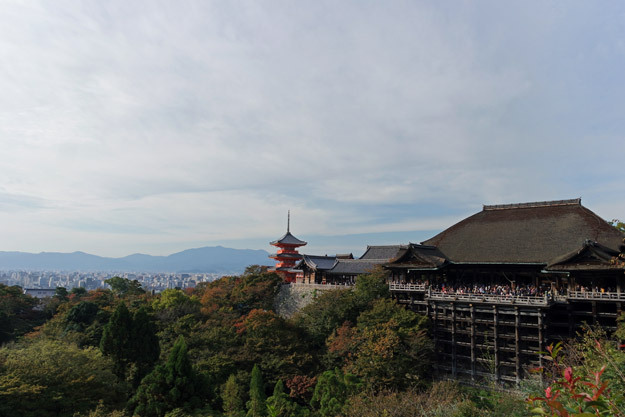 My personal favourite was Kiyomizu-dera. An imposing wooden structure perched on the hillside above Tokyo, it is surrounded by a peaceful forest on one side and a buzzing, colourful market on the other! Definitely a great place to pick up some beautiful pottery, or perhaps a fan or two. 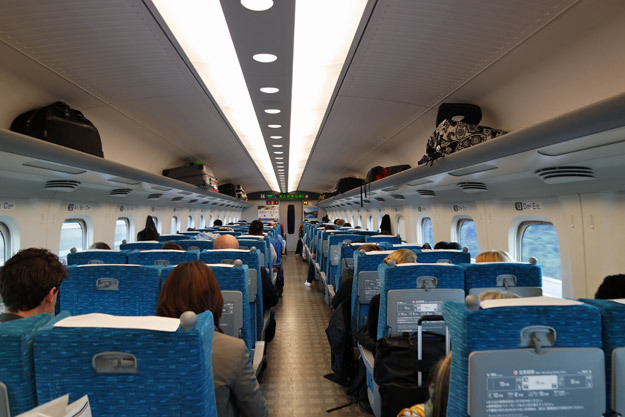 From Kyoto we took the Nozomi (fastest) bullet train and explored the city of Himeji. First we visited the warren-like Kokoen Garden, which is a series of stunning walled gardens beside Himeji Castle. Then we explored the castle itself – an otherworldly white structure, layered and decorated almost like a wedding cake. The interior is quite dark and full of steep wooden staircases as it is kept in its original condition. The view from the top was breathtaking! The last day was spent exploring Hiroshima and Miyajima Island. Hiroshima is a wonderful place to visit, and quite humbling. 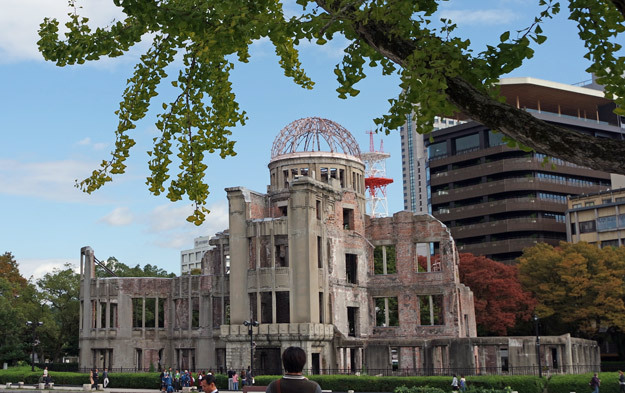 Actually seeing the Hiroshima Peace Memorial and Atomic Bomb Dome was a quietening experience – it is very difficult to imagine what happened in August 1945 when the atomic bomb was dropped over the city. In Hiroshima we had my favourite meal of the entire trip: Hiroshima style Okonomiyaki, or Japanese-style pancake. Two thin pancakes are filled with shredded cabbage, egg, onion, pork and yakisoba noodles. 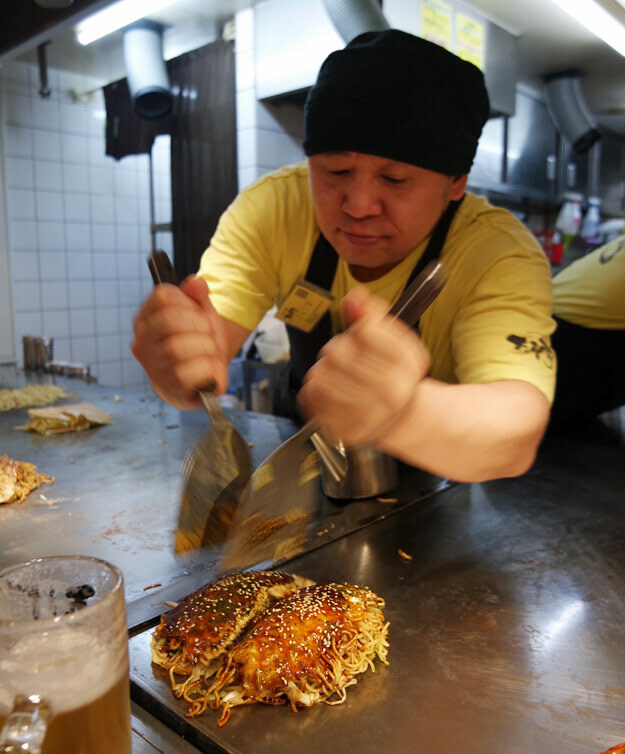 Importantly, Okonomiyaki sauce is added on top, along with Japanese mayonnaise… and served on top of a teppanyaki-style flat grill. Best enjoyed with a pint of Asahi. For more foodie inspiration, read our blog on top food to try in Japan! 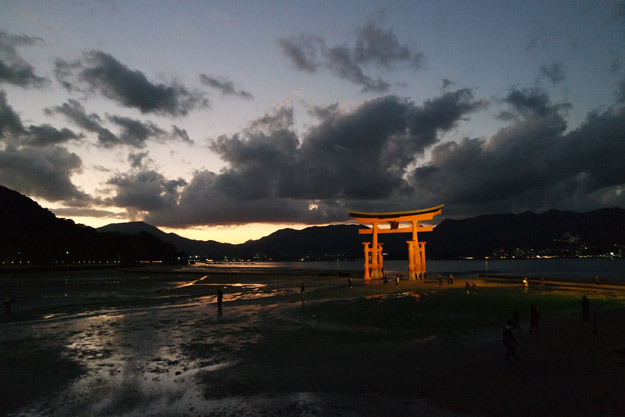 On the final day, we took the ferry to Miyajima Island, where we visited the floating Torii Gate and Itsukushima Shrine. As the sun set, the sky behind the vermillion gate turned light purple and presented us with the perfect goodbye scene on our last evening in Japan. Book a fully inclusive Japan holiday with Wendy Wu Tours, the UK’s leading Asia Experts. 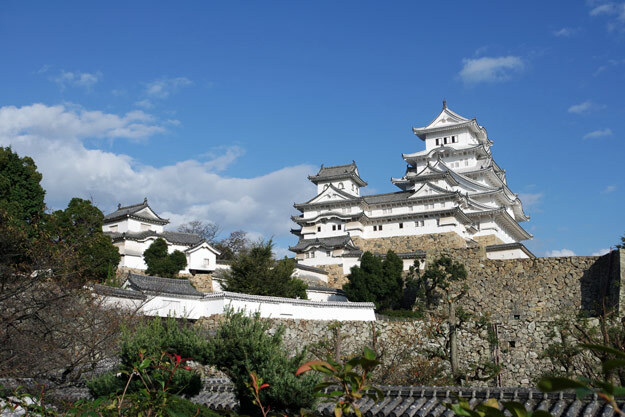 Our escorted tours of Japan visit all the major sights for an unforgettable holiday. Japan fam, photography, sightseeing, tours, wendy wu tours. permalink.